Bottom left photo: Gustavius Smith, Kareem Mortimer, Brian Lee and Tyler Johnston at The Island House on July 12th. I made my first film in 2002 at beginning of 10th grade at Kingsway Academy. So for about 13 years. The subject of Haitian-Bahamian statelessness became important to me when I discovered that some of my friends born in the Bahamas with Haitian descent were having a much harder time getting into college than I was having. I was shocked at my own level of obliviousness about the level of discrimination and bureaucracy they went through to access what I thought was afforded to every person born in the Bahamas. As a Bahamian studying documentary film in 2009, I saw it as an opportunity and my responsibility to expose and educate the public about this social dilemma and what it means to Haitian Bahamian and begin healthy dialouge. 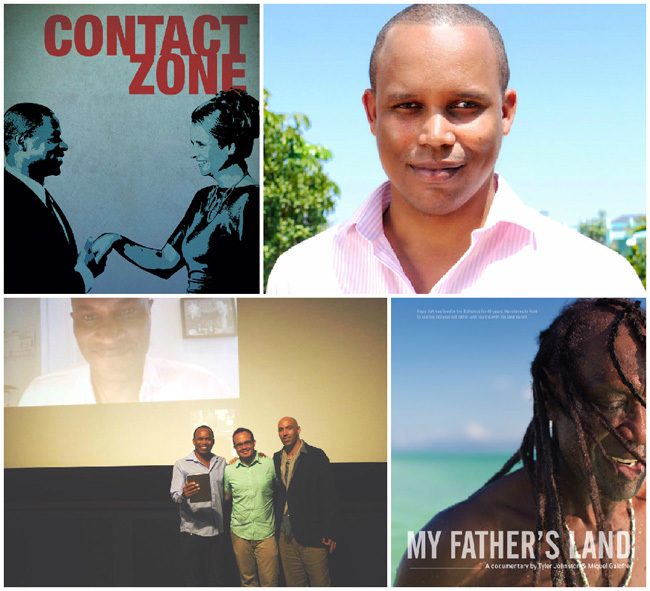 What challenges do you face as a Bahamian filmmaker? The biggest challenge has been finding distribution for educational films about the Bahamas. I'm currently working as an apprentice editor on Ken Burns' upcoming PBS documentary series about the Vietnam War. In the meantime, I am in the developing stage of a side project concerning the oral history of the Bahamas. As a film maker some of the challenges I face are finding the support financially and building the right team for the project. Both go hand in hand, if you have a team dedicated to film - they can help you organise and develop the project. Securing funding for films - is challenging as well - grant writing, sponsorship and investing relationships take time and work. Sometimes you simply have to make due with what you have. Creatively, I find writing and to be both a challenge and a reward. The creative process of imagining the movie and writing it is a mysterious one - sometimes inspiration strikes and its easy - other times you simply have to stick with it and work on discipline. Whats next for me you? I am currently in post production on a feature film called My Father's Land - its a documentary about a Haitian man whom after 40 years of working in the Bahamas as a gardener, returns to Haiti to see his 103 father. My Father's Land trailer is on the web and the co-director Miquel Galofre is working on the final edit of the film. We are interested in developing a crowed finding campaign to help fund some of the completion costs, and enable us to get the film completely edited for the film festival circuit this fall. I'm also writing a comedy web series set in the Bahamas, which I hope will peek the interest of the best in Bahamian talent, sponsors and producers. I have been involved in filmmaking since 2005. I wanted to tell a migration story from the viewpoint of an aspiring illegal immigrant struggling to navigate the thin line between hope and tragedy in order to survive following the enactment of the Patriot Act which provided for the deportation of permanent residents for misdemeanors. I choose the subject my mission to is reframe the narrative of the Caribbean and its people. In the case of Caribbean immigrants they can become invisible once they enter the dominant society and they respond to this in positive or negative ways. Often times the jobs they secure undermine their education and aspirations which can result in a decline of self-worth. Usually the answer to reverse feelings of being marginalized is assimilation to the dominant culture which only tends to take a greater toll on the Caribbean immigrant’s self-worth in the long run. The challenges I face as Bahamian filmmaker is financing of my work. Its hard to get stories about the Caribbean and its people funded.